Steripure offers steam sterilisation services for low moisture products, based on a unique combination of preheating, vacuum and saturated steam injection which is very effective in microbial reduction while preserving the products' organoleptic characteristics. Treatments are optimised for low moisture products such as nuts, seeds, dried fruits, herbs and spices. Processes are validated for a >5 log reduction of pathogens such as salmonella, e-coli and thermo-resistant spores. The service is organically certified and available to importers or processors and other industrials handling low moisture products. Steripure was founded in 2012 by Olivier Bourgois, following the vision that the agglomeration of industries, the more and more sophisticated means of product traceability, increasingly widespread media coverage of food scandals and rising conscience about microbiological risk on low moisture food ingredients will profoundly change the market's need for food safety management. Indeed, closer monitoring of food imports and consumer goods by health authorities and more stringent regulatory oversight have led to increases in the number of recalls and identification of a larger number of food borne illness outbreaks. Recalls and outbreaks carry a huge cost not only in direct recall cost and human illness costs but they are also damaging to brands and entire product categories as a whole. An undetected presence of pathogenic bacteria or a poorly controlled bacterial load can affect the entire product distribution chain and lead to recalls, non-conformities, and significant brand image spoilage or consumer disaffection. Over and beyond regulatory requirements in France and Europe, the market often demands compliance to stringent specifications for producers and importers. Especially big global players such as Nestlé, Mondelez, and others who are striving towards a zero risk policy on all ingredients identified as potential risks in their value creation chain - for example, all natural ingredients like tree nuts, seeds and spices. Steripure offers its expertise, skills and equipment to overcome and manage these constraints and risks, to diversify the possibilities of sourcing and to provide access to new markets. The project started with a pasteurisation installation in Eguilles, France, where the company was able to demonstrate the performance of this innovative process by treating products for several European customers. 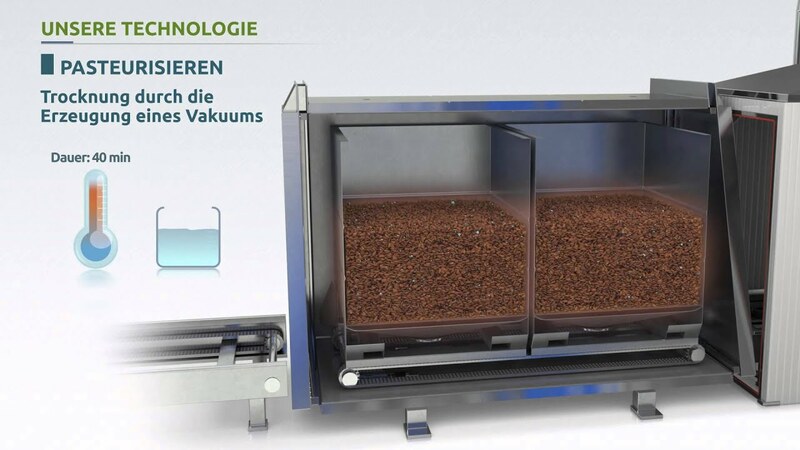 Steripure was amongst the first to invest into high-end technology developed by Napasol, a Swiss company whose process is based on combining vacuum and saturated steam. Olivier Bourgois was familiar with this technology, it having been used for treating vanilla products in the company Eurovanille which he founded with his brother before. In 2013 Steripure expanded into a facility in Rousset, France. There, additional technology was installed to meet growing customer demand, notably two static pasteurisation lines Statisol 50 and Statisol 600 and one rotating unit Rotosol 60. In order to meet the expectations of big account buyers, third party validations for 5 log germ reduction were successfully conducted on the static and rotating units, strictly applying the only valid framework for kill-step validation as prescribed by the Almond Board of California under the Food and Drugs Administration. Economies of scale allowing optimised pricing for high volume orders (100MT+ annual). With these expanded capabilities Steripure meets the demands of customers with very large volumes as well as those with smaller volumes, and can now even more efficiently treat a full line of products while responding to the specific needs of each customer. The solution proposed by Steripure is very efficient at relatively low temperatures with a minimal impact on products even when achieving a >5 log reduction. Steripure now offers a full range of treatments. The Statisol technology allows treating products in bulk bins with preheating and cooling options for products such as nuts, whereas the Rotosol process allows handling powders and seeds in a dynamic process that maintains materials free flowing. Other pasteurisation technologies available on the market which do not work with saturated steam are less efficient in microbial reduction and affect the organoleptic properties of the products with moisture, overheating or mechanical damage. With this level of expertise, capacity and technical diversity Steripure has become the European reference for pasteurisation services. What do you know about steam sterilisation today? Use the most recent technology on the market: The Napasol pasteurisation equipment that Steripure works with is the most sophisticated sterilisation technology on the market today. Each step of the process (preheating, pasteurisation, cooling) is controlled down to the last detail. Every production is monitored via temperature/pressure diagrams. Your expert in sterilisation of nuts, seeds and vanilla: Steripure handles these products since more than four years. Treated volumes are doubling every year. FDA-Type Validated for 6 log-reduction on nuts: Steripure has been validated for 6 log-reduction of salmonella on almonds and macadamia by an FDA-certified laboratory. A detailed report of the validation is available. Choose an Organically Certified Service: Steripure is certified 'Organic' following ECOCERT Standards. The treatment therefore does not affect the organic certification of the products. How do you manage food security for your production cycle? Make your product safe and unique: The Steripure treatment allows for a microbiologically safe product while preserving its natural aspect. Steripure is considered the major European toll service partner providing state of the art pasteurisation optimised for nuts. Homogeneous results on your batch: No matter how many or what kind of analyses you decide to make after treatment, the results will remain the same. Secure your / your clients' industrial process: Pasteurising your products and ingredients eliminates risks of product recalls or contamination of your production lines. Post-treatment analyses guarantee the safety of your / your clients' value creation chain. How do you stay competitive in a growing market with limited supply and ever higher quality requirements? Access new sources and new markets: Thanks to microbial reduction without organoleptic alteration, the Steripure service grants access to sources that would not have been considered safe before. In the same way, new clients with high standards in microbiology can be acquired. Make safe otherwise condemned product batches: The Steripure treatment can avoid product loss due to contamination or shelf-life expiry. Many of the batches that Steripure treats would have been destroyed or depreciated pending the pasteurisation. Preserve your products' organoleptic characteristics: Treated products' taste, smell, texture and humidity levels remain virtually the same, making them appear 'natural' even after Sterilization. You will have a hard time telling a non-treated product from a treated one. What do you appreciate when it comes to your industrial partners and suppliers? Rapid lead time guaranteed: With a production capacity of up to 12 tons per day and a highly flexible production schedule, Steripure guarantees a quick return of product. Complementary packaging services provided: Steripure is flexible concerning the packaging of incoming and outgoing products. From 5kg to 1 ton, any type and size of packaging can be provided - vacuumed inliners included. Minimise product loss or damage thanks to batch system: The batch system (as opposed to continuous systems) allows for minimum use of product during pasteurisation and guarantees product loss below 1%. Steripure offers free tests on a sample batch of your products: Get in touch with our sales department for details. The gentle pasteurization process preserves the flavor and essential oil content of vanilla products and other premium spices. Additionnally to pasteurizing, moisture content can be reduced on vanilla beans in order to prevent new microbiological growth. Visibly moldy vanilla can be washed with a high pressure water stream and then washed and pasteurized. All seed can be treated separately or as mixes. As for tree nuts, the FFA and peroxide levels remain stable after pasteurization with saturated steam injection into vacuum chamber, extending the products' shelf life due to slowed down evolution of rancidity. All seeds and grains are treated on a guaranteed nut-free production line with zero risk of cross contamination. Third party validations that were conducted by strictly applying FDA / Almond board of California norms and prescriptions confirm the capacity of our systems for 5-log reduction of salmonella and subspecies on 6 different seeds. Thanks to pre-heating and saturated steam-vacuum chamber treatment, humidity levels of pasteurized products remain stable. The vacuum suspends competition between air - and steam pressure and leads to guaranteed homogeneous results - even for products with particular shapes such as e.g. walnuts. Unlike after high temperature processes such as roasting, FFA and peroxide levels will remain stable after pasteurization, extending the products shelf live by preventing rancidity. Third party validations have been conducted on Macadamia and Almonds, strictly applying FDA / Almond board of california norms and prescriptions, proving the systems' capacity for 5-log reduction of salmonella and subspecies. Due to their natural properties, powders and bulk raw materials (clay, flower petals, etc.) are often charged with high counts of pathogen or non-pathogen bacteria. At the same time, ionization and other 'hard' processes are less and less an alternative for this market, known for being very sensitive about health-endangering and unsustainable solutions. Saturated Steam Vacuum Pasteurization of Raw Materials for Cosmetic Manufacturing is a sustainable and organic-certified solution that makes natural cosmetics end products more stable, durable, and competitive.